Setting up your new game console in the right place can mean the difference between years of gaming or constant breakdowns. New game systems such as the Xbox 360 and PS3 produce a lot of heat, and heat and electronics don’t mix particularly well. Here are some tips on how to keep your game system running smooth in the long term. Just about the worst thing you can do is stuff your high-powered game system into the back of an enclosed entertainment center or TV stand. There is nowhere for the heat to go, and there is usually a lot of dust back in these dark corners that can significantly shorten the life of your system. So where are we supposed to put a game system? There are quite a few solutions from which to choose, so the goal is to find one that not only performs well but looks nice also. The best choice is a TV stand with an open back and/or open sides. This makes it easier to clean as well as lets the heat move away from your game system. If you aren’t concerned about looks, like if your system is set up in a game room or bedroom, you could also try a simple wireframe A/V rack as that would definitely allow for maximum airflow. 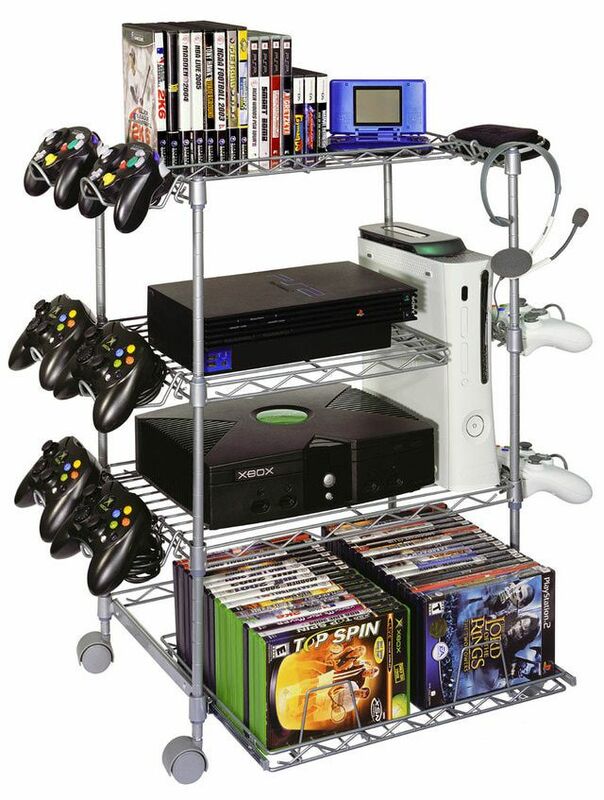 It's also possible to buy a gaming-centric storage rack. Even after you have the location picked out, you still have to dust and make sure things are clean every once in a while. It is also recommended that you take a look at the vents on your game system and clean them as well if need be. Don’t use compressed air to blow the dust-out, because that will just blow it into the system and likely cause a new problem. Instead, you can use a small handheld vacuum to pull the dirt out. Doing this every six months or so can save you a lot of heartache later. Don’t store game cases or other stuff on top of your game systems. It can reflect the heat back into the system and cause the system to not function properly. Don’t leave wired controllers strung out all over your living room. The last thing you want is for the family dog, or young kids, or your dumb friends tripping over them and yanking your game system onto the floor. The Xbox and Xbox 360 have breakaway controller cables so this hopefully won’t happen, but preventing it from happening in the first place is the only protection you can count on. Keep your systems clean. Dust is the mortal enemy of electronics. Fight it any way you can. Keep your systems cool. Use TV stands and/or entertainment centers with open backs. This lets the air circulate so your system doesn’t get too hot. Don’t panic if something goes wrong. Your Xbox 360 gives you error messages and ring of light errors for a lot of reasons. Check your power cables, check the AV cables, make sure it is properly ventilated, make sure there isn’t anything on top of it. If these are all fine, then you can panic. Don’t throw away the box the system came in. They are a handy way to transport the system if you need to since you can keep everything organized and in one spot.